The Rack City hitmaker was served with court papers as he arrived at Penthouse nightclub in West Hollywood on 18 November (16) to celebrate his 27th birthday. Video footage showed the process server handing the rapper the papers as he made his way from his car to the club's entrance despite being pushed away by the rapper's security guards. 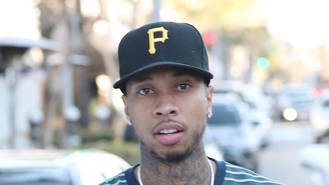 The server has now filed a lawsuit over the incident, claiming he was "grabbed, yanked, pulled and choked" by a member of Tyga's entourage, according to TMZ.com. He claims Tyga, real name Michael Ray Stevenson, green lit their violent behaviour. It is not known what lawsuit Kylie Jenner's boyfriend was being served with back in November (16), but days after the incident, it was reported he had been sued by car dealer Alex Benedict for failing to keep up with monthly payments on a red Ferrari. Benedict claimed Tyga had signed a lease agreement in May (16) for a Ferrari 488 but it was repossessed in August (16) after he failed to pay. They allegedly reached another deal to use the sports car until October (16) but the rapper missed the deadline to return it and it was repossessed again. Benedict then sued him for at least $150,000 (£120,000) in damages. Tyga has allegedly had a number of similar issues with other cars and the lawsuit was the latest in a long line of legal woes. Last year (16), he finally settled a case relating to a long-running jewellery debt with bosses at the Jason of Beverly Hills store, after he allegedly failed to return a diamond Cuban link chain and a diamond pantheon watch he had borrowed in 2012. He was first ordered to pay up in 2014 but failed to do so. The retail bosses went back to court to demand payment, and Tyga finally agreed to hand over the outstanding funds in November (16).